Enjoy just the right amount of comfort and support blended into one luxurious pillow! Red Rock ® Casino and Resorts know the importance of featuring a pillow that has the right amount of comfort and support blended into one pillow. That’s why they feature the Down Etc. 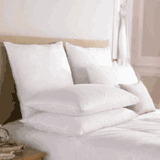 ® 50% White Goose Down 50% White Goose Feather Pillows in many of their rooms. Blending the right amount of down to feather allows for a great pillow. This pillow is even greater with the loft and high quality of Goose feather and down. Enjoy your Down Etc ® pillow today and get many great nights of sleep for many years to come.